I’m sure he won’t mind us mentioning it, but club stalwart Phil Gillard is now Officially Old. Choosing to celebrate his move up into a new V50 category with a run out at Hathersage last night, old age clearly seems to be working well for him. 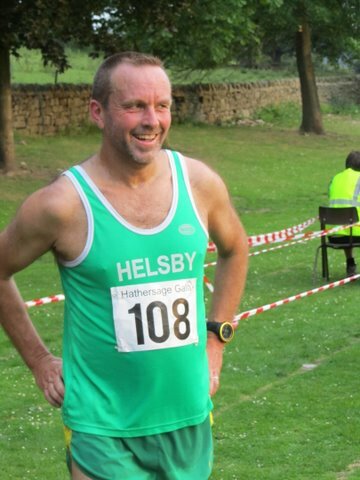 Phil’s had a good year so far and a steady improvement in his times, ticking off a fair few fell races along the way. 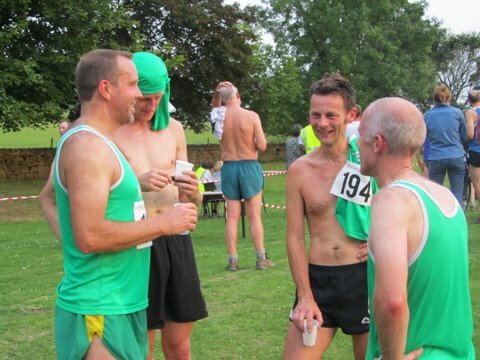 The club’s present to Phil was the Hathersage Gala fell race in the counter series. 7 vests made it over to the beautiful gritstone high peak, somewhat further afield than our normal outings, and were rewarded with a 4.5m loop with just over 1000′ of climbing. 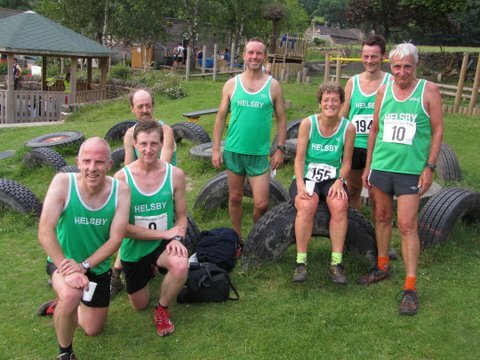 A warm evening and a big turnout, mostly runnable terrain with a couple of short scrambly sections over the back of Higgar Tor (a special place for your author!). Jim made hay with a fast start to avoid most of the queues at the early stiles, caused by the big field, to lead the Helsby charge. A fit local population, along with the catchment of the outdoorsy capital of the UK (Sheffield) meant it was a pretty high standard race with many great performances from talented unattached runners, as well as the regular Peak clubs, and a good dose of people just giving it a go. 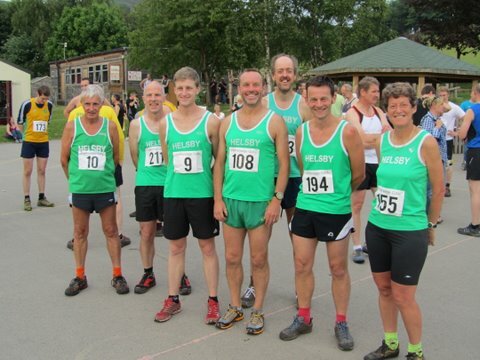 A record turnout on the night for the 4.5mile (BS) race with 243 runners in total, 7 of them with the Helsby green vest led by a commanding performance by Jim O’Hara but with strong runs all round. Full results available here, although I’m not sure why there appears to be no v70 category! Well done to everyone taking part. Creditable mention for a decent run from Jackie, straight off the back of a tough two days in the Lakes for the SLMM. …hopefully some pics to follow from Bill and Helen.